Earth Day & Good Shepherd Sunday: why have we not seen these two together? Today is what is known as Good Shepherd Sunday. The three passages we have work together really well in a shepherd-y way. In Psalm 23 and in the John 10 passage God is called a shepherd. - In John 10:11-18 Jesus says that he is a good shepherd who lays down his life for the sheep. - The 1 John:3:16-24 passage uses the exact same words that Jesus’ uses by saying that followers of Jesus ought to lay their lives down for one another. So these three texts are very well connected – two passages describe God as shepherd, and the third recommends that God’s followers to imitate the shepherd’s call by laying down one’s life down for others, which reveals a strong love for others. Today is also Earth Day. It seems to me that there is some great connection with these two observances. 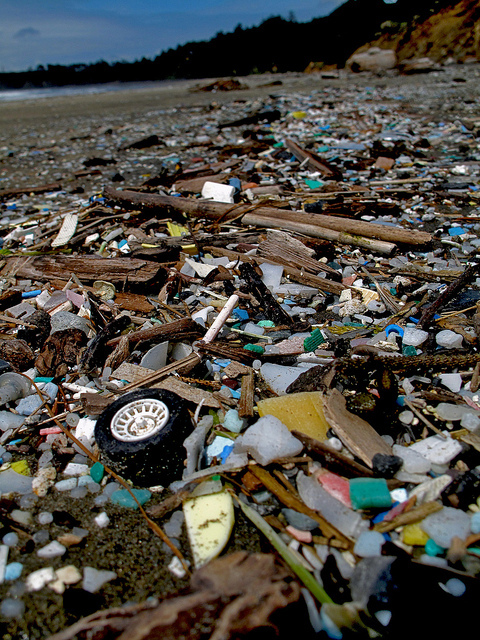 When I got to digging around, though, I found a disappointing lack of available material that ties together shepherding with stewardship of the planet. In looking up environmentalism and “Good Shepherd” most of the few articles I could find were distressing. They bashed efforts by Christians to advocate for the environment, and referred to this parable in ways that I had not considered. So this Good Shepherd passage has been used in some odd ways that I had not considered before. And these are not articles from kooky fundamentalist websites. They are sites that are primarily reporting on policy, investigating non-profits, and even in the Case Western Reserve Law Review. Truth be told, there are probably a whole lotta people in the world who will think that the connections that I see so clearly between Good Shepherd Sunday and Earth Day are very strange indeed as well. Feel free to keep that in mind. It’s very interesting that the early church very, very frequently used depictions of Jesus as a shepherd in art. 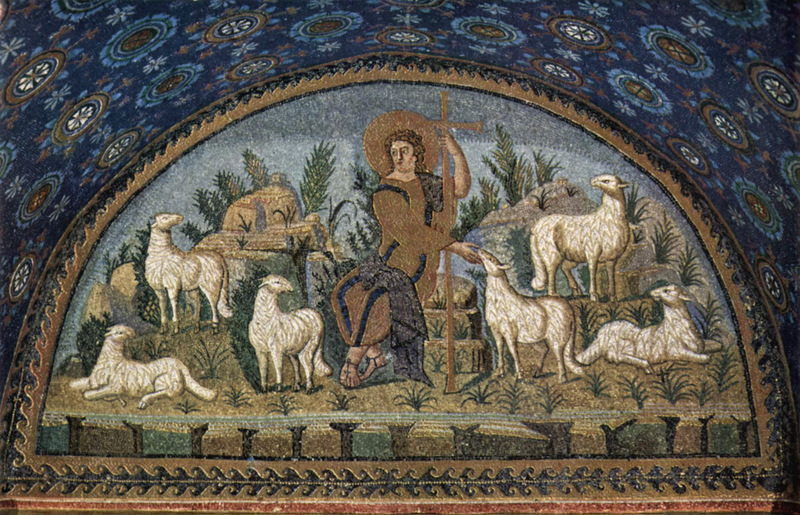 He is depicted in simple clothing (a white tunic, usually), with a staff, amidst some sheep. It was super common. Christianity became the religion of the Roman Empire in the year 380 CE. Soon after, these shepherd images began to give way to depictions of Jesus as a teacher, or as a King, in a more royal setting. Christianity had become the religion of the Empire, and it was now on top. No longer did they need a humble, protective Savior who could identify with the meager and offer protection for the vulnerable, a caring shepherd over the religion of the oppressed. Instead, artists showed a Jesus who looked fit to be a king. While we don’t particularly understand how the early church interpreted the image of Jesus as a shepherd, and it’s too simplistic to say it was ONLY due to the rise of the power of Christianity, it is telling that this representation fell out of fashion. Jesus wasn’t needed as a shepherd anymore. People weren’t being martyred or jailed or pushed to the margins for their faith. The Christian religion was on top, and it became beneficial to profess faith in Christ – you’d never gain traction politically if you didn’t swear allegiance to the church. This power motif bleeds into a lot of our faith. I don’t want to bash Christianity today, and yet we need to be honest that the sense of Lordship extended into the assumed right of humans to dominate the rest of the planet. It’s almost like this shift from shepherd to king parallels the movement of Christians who ignored the original role of Adam and Eve as gardeners carefully tending a plot of land, and instead opted for the “Lord over” motif by running with the dominion theme. The thought that “God placed humans over this creation, so let’s beat it into submission and get as much out of it as possible for our own pleasure and gain,” is a sad legacy of a lot of Christendom. Add to that the belief that we are only on this planet until Jesus comes back so we can deplete it as much as we want, and it’s a recipe for disaster. This posture tosses aside Jesus as a shepherd. But what, exactly, is being tossed out? What does it mean to be a shepherd, and what is lost by moving toward this king-ship, or dominion model? Shepherds watch, guard, guide, protect, feed, shear, nurture, and LOVE the sheep. A shepherd cares for and works on behalf of their flock. Sheep don’t typically do well on their own, so it’s up to shepherds to make sure they thrive. As the John 10 passage says, the shepherd lays down their very life for the sheep. The hired hand does the same bullet points as the shepherd, so maybe it does come down to ownership and this parable is really teaching us that capitalistic consumerism is the way to save our planet. But no, that can’t be right. Ownership certainly does NOT necessarily equate compassionate caretaking – look at mountain top removal mining, or deforestation, or aggressive fracking, or drilling for oil in fragile backcountry. Many of these locations are owned and yet the owners could care less about how their caretaking affects the well-being of the landscape or the wildlife. However, if it was in the owner’s backyard – well, then you’d have something different. There’s a reason why the Dakota Access Pipeline was slated to go through the Standing Rock Sioux Indian reservation instead of the original plan of Bismarck. There’s a reason Flint, MI, has been subjected to lethal water. These are people who are “over there,” and don’t have as much voice or power. Owners and caretakers in these cases and many others don’t have a vested interest in the well-being of the life that is on or adjacent to what they own, when what they own can be reaped for profit. So what’s the difference here between a profit-driven owner and shepherd? But I *think* it has something to do with an understanding of the inter-connectedness of life. Yes, the shepherd makes a living from the wool, and maybe the milk, and maybe even the meat of the flock. Yes, there is self-interest. But there is also some kind of mutuality – the shepherd relies on the sheep for money for food and a home, and the sheep rely on the shepherd for food and a home. The shepherd knows that they are intricately connected with the sheep – their well-being is bound up together. And it goes beyond this: the well-being of the land and the well-being of the water sources is vital for the health of the sheep and the shepherd. The well-being of the water table or the mountains is vital for the water. And it goes on and on. Ask a permaculture farmer what they do, how and why they do it, and you’ll be aghast at how all of life is so interdependent. A loving shepherd probably has a sense of this. In order for the whole thing to keep going, the shepherd has to do their part, even if that part means laying down their life for their flock. It’s all-in commitment, all-in community with a bunch of smelly, stubborn, and dim-witted creatures that directly provide life and sustenance to others through wool, and milk. We are interconnected to all of life on this planet. Maybe even in this galaxy and universe. My well-being is bound up with the well-being of all the other life. This is the basis for racial justice, for peace, for sustainable progress. And yes, for Earth Day. 23 And this is God’s commandment, that we should believe in the name of his Son Jesus Christ and love one another, just as we have been commanded. Love is not word or speech (or, “thoughts and prayers”), like this sermon. Instead, love is truth and action, and yes, laying down our lives for the sake of other life. Well, because following Jesus sometimes isn’t easy. Just because we’re not doing something now doesn’t mean we don’t’ change. Reducing our carbon emissions WILL require inconveniences and even hardships on our part. It WILL mean using less fossil fuels. It might very well mean giving money to alternative energy projects. It might mean volunteering to collect signatures to get policies like ground-breaking initiative 1631 on the ballot for November. It might mean imparting severe restrictions on plastic in your home, or committing to ecological restoration projects, or never buying another [“insert very strong expletive”] plastic bottle of water ever again, or getting a bus pass, or not flying, or learning to ride a bike in the rain, or joining the political sphere to advocate for better policies that will have a substantial effect on the health of our land, our flora and fauna, and our world. When we see that we are shepherds, when we see that we are intricately bound up with all life on this planet, when we see that we have agency and power in the current and future well-being of other life on this earth, then maybe we can begin to understand and to move toward laying down our lives for one another. Laying our lives down for the life with which we are intricately bound. Which means laying our lives down for ALL life. For all the keystone species across the world, like salmon and eel grass is here, like all the trees that keep us breathing, and the soil and water that keeps them growing, like the species on the verge of extinction, like refugees who are displaced due to severe weather events. Our actions here, from day to day, and year to year, has an affect on life near and far. How will we use this life to do what we are called to do, to love one another? Today is Good Shepherd Sunday. It’s also Earth Day. We have power, we have agency, and WE HAVE the Good Shepherd who has endless love, and endless compassion, and who gives of these unceasingly. May we know this love. May we live it. ‘I am the good shepherd. The good shepherd lays down their life for the sheep. 1 John 3:16-24 We know love by this, that Jesus laid down his life for us—and we ought to lay down our lives for one another. 17How does God’s love abide in anyone who has the world’s goods and sees a sibling in need and yet refuses help? 18 Little children, let us love, not in word or speech, but in truth and action. 19And by this we will know that we are from the truth and will reassure our hearts before him 20whenever our hearts condemn us; for God is greater than our hearts, and God knows everything. 21Beloved, if our hearts do not condemn us, we have boldness before God; 22and we receive from God whatever we ask, because we obey the commandments and do what pleases God. 23 And this is God’s commandment, that we should believe in the name of his Son Jesus Christ and love one another, just as we have been commanded.24All who obey the commandments abide in God, and God abides in them. And by this we know that God abides in us, by the Spirit that has been given to us. 1 God is my shepherd, I shall not want. 2 I have the freedom to lie down in green pastures; I am guided to still waters; 3 my soul is restored. For God’s own sake am I led on right paths. 4 Even though I walk through the darkest valley, you are with me; your rod and your staff—they comfort me. 5 You prepare a table before me in the presence of my enemies; you anoint my head with oil; my cup overflows. 6 Surely goodness and mercy shall follow me all the days of my life, and I shall dwell in the house of God my whole life long. https://capitalresearch.org/article/greener-than-thou-the-american-left-takes-up-christian-environmentalism/, from the original source, Watt, James. Ours Is the Earth. Saturday Evening Post (January/February 1982): 74-75. This past Sunday many churches recognized Epiphany. This event recognizes one specific story: the journey of the Magi from “the East,” who want to pay homage to a child who has been born the “King of the Jews.” They have deduced this baby-king by reading the stars, and even though they are from a completely different land, the Magi undertake a long journey to revere an infant of another culture and religion. Of course, Epiphany, literally, means some kind of personal revelation of a new concept/realization/experience that has the power to change one’s life or way they look at the world. It’s a massive “aha” moment. Or at least that is how I usually define it, but the word can also mean “the appearance or manifestation, especially of a divine being.” In the case of the Magi, the Epiphany is the first manifestation of Jesus to the Gentiles. During this winter break I went for a walk at Lake Padden with a new friend. She had wanted to swap stories about how we have experienced God in our lives. I had made a comment a few weeks before about having heard God talk to me, and she wanted the particulars. The bonus was that I got to hear bits of her story as well. I told her about the two instances that I have deemed as God talking to me, and in the telling of those stories, I realized another, and then another, and then another, when it felt like I was receiving pretty clear direction from God. I’m really, REALLY cautious about stating “God told me,” like REALLY, and yet in these occasions it feels fairly safe to restate to others with at least a little confidence that “It certainly felt like God was speaking to me.” These experiences were quite significant in my life, and it felt good to remember them as a group of incidences. My walking partner relayed stories to me where she had woo-woo experiences that she, in the same cautious way, said were occasions where she thought God was communicating with her directly. The interpretation might be a little sketchy, but her best explanation was that God was reaching out to her, which induced a sense of wonder, gratitude, and mystery. Two weeks prior I had a lovely phone call with a person who used to attend Echoes but had moved away. They told me that they had had a recent epiphany experience with God. They wanted me to know that God had reached down and revealed God’s self to them, and they were basking in the glow of the love, acceptance, and harmony of that encounter. My skeptical self is usually to be like, “hmm, okay…” It’s possible that the energy behind this encounter will fade, but there’s no point in MY denying that this epiphany really happened. And in the retelling of their story I learned a few things theologically that were really profound. God met this person, and I got to hear the story because they wanted to say thanks that Echoes had given them a safe space to re-envision the church as a place that could be safe. They said, “Echoes led me to the river of God, but didn’t push me in.” After this experience they feel like they are in the river, and that Echoes had a role in getting there. I loved hearing that. This past week, in reading the story of the visit of the Magi in preparation for Epiphany I was struck by the vortex that was created by the birth of Jesus. Jesus is born and the shepherds are recruited to drop what they’re doing and worship this newborn baby. Jesus is born and travelers from the East show up because they’ve been reading the stars and they want to locate the “child who has been born the King of the Jews” because they want to pay homage to the child. We don’t really know who these people are. Christmas carols would say that they are three Kings from the Orient, we have no idea how large the party was, no idea what their occupation of society position was, nor exactly where they were from. So we cannot confirm that there were three, that they were kings, nor that they were from the Orient. There’s good reason to believe that they were magicians or astrologers, but we don’t know. And if they came from a long way off they might have had a really party with them, maybe men and women. There is so much speculation around this story, speculation that adds nothing of value. The people presumably had NOTHING to do with Israel. They aren’t Jewish, they don’t need to be in good graces with Israel, and they probably had careers that would be very reviled by the religiously-observant in Israel. But they saw a star, determined what it was, and seemingly could not resist coming to Jerusalem to find this infant who would become the King of the Jews. It’s not like we have stories in the Bible where this is a common practice. Something about this story, and this baby, pulled them in. From a very different cultural context. From a very different religious context. From a very different political context. Maybe or maybe not on camels, but they came a long distance. The stories that I have experienced, that the friends I mentioned above have experienced, that these travelers in the Matthew 2 text experienced, plus the shepherds, plus the crowds that gather to hear Jesus preach, plus the millions of people throughout history who have been pulled in, mysteriously, inexplicably, to this Jesus person…it all kind of sounds like a vortex. And I didn’t really know what a vortex really was, but it sounded appropriate, so I looked it up. So, something swirling creates a pull towards the center of the swirl by the very nature that it’s swirling. Jesus seems like this swirl, this vortex. He is born and people start gravitating towards him immediately. Shepherds come, travelers from the East come, and even Herod get pulled in toward him when Herod perceives Jesus as a threat. If Jesus really is a vortex, how are we pulled in? In the conversations that I had with the people I mentioned earlier it was helpful for my connection to God to consider how and when I had been pulled in by God. This being Epiphany, and it being the beginning of a new year, I’m wondering of the many ways Jesus might still be a vortex. In the course of discussing this concept at a weekly clergy gathering today, someone said something like this: “Maybe it’s simply a fact of realizing that we’re in a vortex toward Jesus. That in itself might be the Epiphany.” Maybe so. We are well into Advent. Less than a week until Christmas, actually. And yet I continue to reflect upon the BEGINNING of Advent season. At the start of each Advent, in the lectionary (the three year cycle of Bible readings used by a whole whack 'o churches), the gospel reading is about Jesus coming back. It doesn't contain any of the details about the story that culminates in the birth of baby Jesus, and instead propels us into the future - the future when Jesus comes back down out of the sky, after a 2000+ year hiatus. This year the reading is Mark 13:24-37. The word “Advent” means the coming or the dawn of something – like the advent of the wheel, or the advent of ultra light backpacking gear, or the advent of bipartisanship. So Advent has a few layers – it looks back at the FIRST coming of Jesus, and Advent looks forward to the SECOND coming of Jesus. Thus the passages about the second coming of Jesus to start out the Advent season. In this Mark 13 passage, Jesus himself is talking about his second coming. In other parts of the New Testament others talked about his second coming. He says some odd, contradictory stuff, like “Don’t even try to predict when this is going to happen,” alongside, “Study the fig tree to know when this will happen.” The overall gist, though, is fairly obvious that Jesus states unequivocally that he will be coming back. And, it appears that Jesus says he will come back within the same generation as the Biblical writers. But…Jesus hasn’t come back. We celebrate his coming back every year at this time, and he’s still not back. A few weeks ago, in the midst of writing a sermon on this topic, I was explaining the concept of the second coming to someone who did not grow up in church (like, at all). My words sounded so strange even to me: Jesus, this guy who died and came back from the dead eventually ascended into heaven, and he was going to come back and everything, all things, would be okay again. Seriously, this sounds loony. For 2000 years our faith has held this. Two thousand. When it was first prophesied there were no cars. There were no flush toilets. No one had any idea the world was round. There had been no popes, no wars between Protestants and Catholics, no vaccines for common diseases, no knowledge of distant continents, no synthetic fibers or eyeglasses, and only 3-10% of the population could read. In one millionth of a second after the big bang the universe had already grown the size of our solar system. One millionth of a second. By one, full second it was already a few light years across. One second. A lot can happen in a small space of time. And when did the big bang happen? Scientists estimate 14 billion years ago. It took nine billion years of universe expansion before our own star, the Sun, was even formed. DeGrasse Tyson states that scientists do not know what was before the big bang, how the big bang got its start, nor how “organic molecules transitioned to self-replicating life” in the oceans of planet earth. He doesn’t seem to have much patience for religious persons saying that it was God who started this whole thing off, but it makes sense to me. deGrasse Tyson completely reasonable to say that we *might* find an explanation for these mysteries some day, but I'm going to fall back on the insane number of mystics in history who have communed with some semblance of the divine and chalk it up - with a large dose of humility - to God. In other words, our unrest with the present is in itself evidence of hope. It’s evidence that God is also experiencing unrest with the world continuing on as it is. With the return of Jesus is the return of all good to the earth: no more pain, no more tears, no more war, no more unjustness, no more harming the planet. As church, we work toward this reality of transforming the present because of the chafing and unrest that Moltmann talks about, and because this universal future of Christ is the end of all things, it’s how all things end; when life as we know it utterly transforms into a global community that lives in harmony and peace with the principles of Jesus. We do what we do because the God of the future is ultimately moving towards this transformation and we participate in this, too, by pushing back against those places in ourselves and in our systems that create pain and oppression. It can be hard to see God. But it’s not hard to see the pain of the world, the pain of our friends and family, the pain of this community. And it’s the pain that kindles the hope. The very thing that looks like it robs us of hope is actually what causes it. The world isn’t supposed to be like this. One of my most helpful theology books in seminary was on the topic of sin and was called, “Not the Way It’s Supposed to Be,” by Cornelius Plantinga. The premise is that the world isn’t supposed to be led by sin; that’s not how it is designed, and it’s not the direction God is leading it. On Thanksgiving Eve this year I had the chance to speak at our local Interfaith gathering. It’s an annual gathering and often I’m unable to attend. This year, instead of offering some sort of blessing from the Lutheran tradition, I decided to tell of some good things that have happened in the world in the past few years. A high school student in Florida started a club so that no one would ever have to eat lunch alone again. These things fuel some hope. The harsh things in the world fuel hope as well, according to Moltmann, even though I don’t even actively realize the harsh things ARE fueling hope in me. But the world is moving in some kind of direction that will eventually lead to the universal presence of Christ. The idea is only 2000 years old. We can keep looking. We can keep looking for the wonder of the world that is being redeemed on very small scales every day. We can keep actively chafing against the Unlikeness of Jesus in ourselves and in our communities, and in our world, by spreading compassion, by living justly, by promoting justice, by not succumbing to despair. The sights and sounds of the coming Jesus may be faint, but keep listening and looking. May we not only hold our breaths to listen, but breathe out the movement of Christ, the returning Christ, into the world.